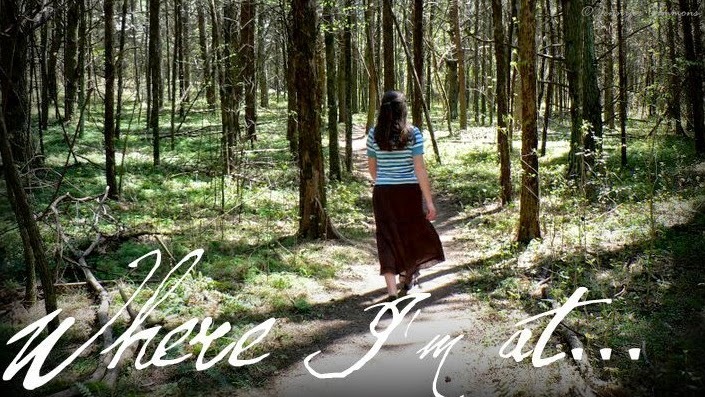 I simply love writing these “Where I’m At” articles and I love going back to read them even more because I am able to see where God has led me since the last addition of the article. When I last wrote, it was 4 o’clock and I was in my PJ’s thinking about my approaching 18th birthday. Where am I today? Today, I am munching on chocolate-chip-cookies in my comfy chair watching raindrops slide down my bedroom windowpanes on this beautifully gray, rainy day. Despite the gray sky this afternoon, summer is in full swing around the Horton home bringing with it severe weather, heat waves, baseball games, rodeos and trips. In my last article I said, “By my next ‘Where I'm At’ I may be saying, ‘I'm staying home another year.’, or it may even say, ‘I'm going to school in California.’” Neither of those scenarios are the case. In fact, two weeks ago I finished my first year of college. I decided to start school at a small community college about thirty miles from home. God has repeatedly shown Himself throughout this freshman year. I was able to take my entire first year online, with the exception of one night class, which was a huge blessing. Through God’s excellent planning, I was able to complete this year of school at home while still being available to help around the house and with the younger kids’ schoolwork. To all of you homeschoolers out there that have been told you won’t be able to handle college, let me share what I’ve learned this past year. One of my concerns was that I would somehow be shocked by the workload and be unable to make good grades despite having made good grades all through my homeschool journey. That fear was quickly debunked. Compared to my public school classmates, I felt far more prepared. Throughout high school I learned by reading and studying textbooks, writing essays, and taking exams on the material I had covered while managing my own schedule. That, my friends, is exactly how college works. Thanks to my mother’s hard work and planning, the academic workload transition was minimal. My mother also made it a point to prepared me for the devastatingly God-less state of schools, and yet I was still shocked by the hostility towards Christians in schools today. I began school with the mindset of someone moving into new territory. I looked forward to the new experiences ready to learn, but I also knew there would be battles fought along the way. In the first week, I was assigned to read and review with my own opinion an article stating that Jesus is a fictional character believed in only by the small-minded. Just imagine an explosion of truth on paper…that’s the best way I can describe my response. By the next week, I had been taught that the Bible is all fiction, the walls of Jericho fell down instantly for reasons unknown to archaeologists, and the world is billions of years old and without a Creator. I had underestimated the number of battles to be fought in this new territory. Every reading assignment was packed full of pure lies. I had expected and looked forward to reading classic great works, but was met instead by poorly written lies by unheard of modern authors. It seemed like the semester was a constant fight to defend the Truth of the Bible that reached its peak with the writing of my final essay for English Comp I. The paper was to be an argumentative essay arguing my opinion on a topic of controversy. I chose to write on the recently petitioned and shot down ultrasound law here in Oklahoma. This law would state that all women seeking an abortion must have and watch an ultrasound of their baby before the abortion was performed. The law was shot down on the basis of infringement of women’s rights. I argued in favor of the law and the rights of the fetus with scripture supporting my argument. Upon turning in my essay I was notified by my professor that the topic I had chosen would not be accepted due to the use of Scripture and the risk of offending others in the class. I then asked if I could write on gun control laws in the state. This was also found “too controversial.” I had very little time before the final was due and had already written one entire essay. I then began researching constitutional religious freedom and freedom of speech in schools and universities. As I already knew, my professor was infringing upon my religious freedom and freedom of speech. With that information in mind, I asked if I could write the essay on religious freedom in schools. Once again, this topic was shot down and a note was added that I should not bring religion into the assignment. With less than a week to write a rough and final outline, gather works to quote and write a works cited page, write a rough draft, and write a final draft, I was tired of being told I was not allowed to bring God into my essay. I had tried hard all semester to bring His Truth into every written assignment given to me. I looked at the topics submitted by my classmates. Among some very uncontroversial topics there was a paper on “God’s support of gay marriage.” That paper offended me as it was completely unbiblical and even blasphemous of God’s Word. Another paper discussed how bad homeschooling is for children and their families. This argument also held no truth. Finally, I emailed my professor. As politely as I could muster, I quoted The Constitution defending my religious freedom and freedom of speech, mentioned the two highly controversial essays, and informed her that I would be writing my essay on the benefits of home education using Biblical references. I did not get a response to that email, but my essay was accepted. Jesus, the Son of God, calls you and me His friends. He loves us so much that He laid down His life for us and took our punishment and yet I’m sitting here feeling so good about myself for being willing to defend His name in one little college class. He gave it all and asked only that we love Him. I can’t let myself not defend Him. I can’t. It’s not enough to just quietly say my prayers and keep my mouth shut when I’m told. It’s time for action. The future of our country depends on people willing to fight the little battles today because if we all keep our mouths shut this world is never going to change. Change starts with the little things. We can choose to watch the world mock our faith in Jesus or we can choose to take a stand every day in every little battle. Prepare for those battles with His armor and live out your love of Christ. Where am I? I’m a soon-to-be college sophomore learning just how lost our world is and how one person can make a difference even in the smallest ways. I’m trying my best to follow His lead step by step. I still plan to go to vet school and was blessed to have been able to spend a week working with my cousin who is a vet in Texas. I loved every second of it and can’t wait to go back! My evenings this summer will be spent at baseball games all over the state as five of my seven siblings are playing this year. In addition to baseball, I have already been asked to help some local churches with their Vacation Bible Schools. I’m continuing to better my photography skills and hope to do some sessions this summer. Another goal for this summer is to break my 3-year-old colt to ride. I may also be going back to work at the office; this time working for Daddy as a paralegal. I’m excited to be going on some small trips throughout the summer rather than one long vacation. Somewhere in all the crazy fun busyness of summer I will be turning 19 and beginning my last year as a teenager. I can hardly believe it’s come so fast! I can’t wait to see what God has in store for me throughout this coming year. I know He has an awesome plan!